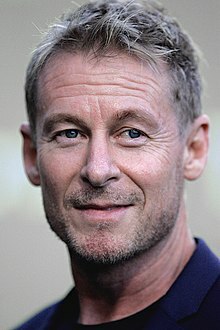 Richard Roxburgh (born 23 January 1962) is an Australian actor, writer, producer, and director. He has won acclaim for his performances on the stage in productions by the Sydney Theatre Company and others, in Australian films and television series (Baz Luhrmann's Moulin Rouge!, Rake), and in a number of Hollywood productions (Van Helsing, Mission: Impossible 2). Roxburgh was born at the Mercy Hospital in Albury, New South Wales, to John (d. July 2011) and Mary Roxburgh; he is the youngest of six children. John Roxburgh was a successful accountant. Richard Roxburgh played Willy Loman in the Albury High School production of Death of a Salesman in 1978. Roxburgh studied economics at the Australian National University in Canberra, where he resided at Garran Hall and graduated with a B.Ec. in 1984. After graduating from ANU, he decided to become an actor and was admitted to the National Institute of Dramatic Art (NIDA) on his second audition attempt. Roxburgh began working with the Sydney Theatre Company as soon as he graduated from NIDA. He came to public attention for his portrayal of New South Wales Police Force detective Roger Rogerson in the 1995 television miniseries Blue Murder. Through the 1990s, he appeared in several Australian film and stage productions including a critically acclaimed turn as Hamlet alongside Geoffrey Rush, Jacqueline McKenzie and David Wenham in the 1994 Company B production at the Belvoir St Theatre in Sydney. In December 2007, he played the lead character, Roland Henning, who suffered writer's block in Michael Gow's play, Toy Symphony, at the Belvoir St Theatre, winning the 2008 Helpmann Award for best male actor in a play. In 2000, Roxburgh appeared in the first of several international blockbuster films as henchman Hugh Stamp in the John Woo-directed Mission: Impossible 2, which was filmed in Sydney. Also filmed in Sydney was Baz Luhrmann's Moulin Rouge! (2001), in which Roxburgh played the Duke of Monroth. Roxburgh appeared as three iconic characters over the next three years: he played Sherlock Holmes in 2002's The Hound of the Baskervilles, Holmes's nemesis Professor Moriarty in 2003's The League of Extraordinary Gentlemen and Count Dracula in 2004's Van Helsing. He is one of only two actors to have played all three of these characters, the other being Orson Welles, who played them in separate radio programs. Roxburgh directed his first film, Romulus, My Father starring Eric Bana, released in 2007. This film won (and was nominated for several more) the AFI Award in December 2007. In 2008 and 2009, he played the lead role of Art Watkins in the ABC drama series East of Everything. In July 2010, Roxburgh played former Australian Prime Minister Bob Hawke in a telemovie based on Hawke's life. In November 2010, Roxburgh co-created and began starring in the critically acclaimed ABC1 television comedy-drama series Rake as the brilliant but self-destructive Sydney criminal barrister Cleaver Greene, a role for which he won the Australian Academy of Cinema and Television Arts Award for Best Lead Actor in a Television Drama in 2012. He stars in Matching Jack, which was released in August 2010, and Legend of the Guardians: The Owls of Ga'Hoole, released in September 2010. Returning to the stage, Roxburgh played Vanya opposite Cate Blanchett, Hugo Weaving and John Bell in Sydney Theatre Company's 2010 production of Anton Chekhov's Uncle Vanya. In 2013, he again performed at the STC with Weaving as the protagonists in Samuel Beckett's play Waiting for Godot, Weaving as Vladimir and Roxburgh as Estragon. In 2014, Roxburgh played the title role in Edmond Rostand's 1897 play Cyrano de Bergerac at the STC. In 2015, Roxburgh appeared in Andrew Upton's adaptation of Chekhov's play Platonov, titled The Present, for the STC. It was directed by John Crowley and featured Cate Blanchett, Jacqueline McKenzie, Marshall Napier, and Toby Schmitz. That production moved in 2016/17 to the Ethel Barrymore Theatre in New York City for the Broadway debut of Roxburgh and the rest of the cast. Roxburgh wrote and illustrated the well-received, 240-page children's adventure fiction title, Artie and the Grime Wave, published by Allen & Unwin in October 2016 (ISBN 9781760292140). Roxburgh married Italian-born actress, blogger, cookbook author, and television cookery show personality Silvia Colloca in 2004. They have three children. 2001 – nominated: Moulin Rouge! ^ Harvey, Shannon (19 May 2007). "Richard Roxburgh". The Sunday Times. ^ "Richard Roxburgh". Talking Heads. ABC. ^ ANU Alumni. 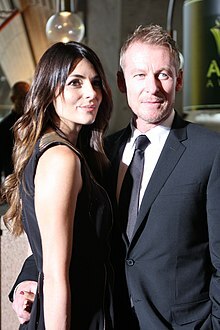 "ANU Alumni – Congratulations to alumnus Richard Roxburgh". Facebook. ^ Lehmann, Megan (1 February 2014). "Richard Roxburgh plays Cleave Greene with conspicuous conviction". The Australian. ^ "Archive: Richard Roxburgh". Sydney Theatre Company Magazine. 15 October 2014. Retrieved 20 October 2014. ^ a b "Richard Roxburgh in East of Everything, and Bob Hawke". Herald Sun. 26 August 2009. ^ Roxburgh, Richard (9 November 2013). "Waiting for Tamas". The Sydney Morning Herald. Retrieved 26 November 2013. ^ Maddox, Gary (19 May 2007). "Proud father". The Sydney Morning Herald. Wikimedia Commons has media related to Richard Roxburgh.